Shifting marriage and divorce patterns. Transformation in the workplace. The growth of the women’s movement and the development of the men’s movement. All these social and cultural changes have changed fathers’ traditional family roles and forced a reexamination of how fathers and children interact. 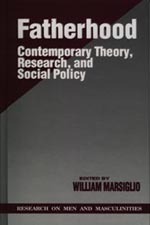 Progress in this new understanding of fathers is highlighted in Fatherhood, a volume of theoretical and empirical research on fathers in families. The research pieces, written by such well-known scholars as Furstenberg, Seltzer, and Greif, examine differences in culture, class, nationality, and custodial status. The articles focus on legal, economic, and policy questions, as well as on the interaction between fathers and children within the family. Some of the topics explored are fathers’ involvement in child care, fathering in the inner city, and single fathers who have custody of their children.